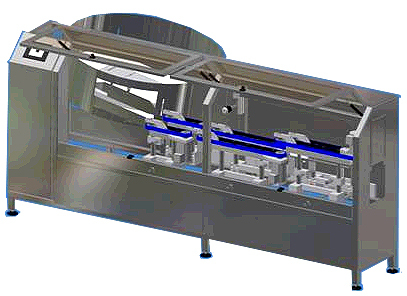 Completely automatic productions speeds of up to 400 bottles per minute. Capable of orienting containers from 10cc to gallons. Independent speed control for each machine function. Calibrated settings minimize set-up during changeovers. Magnetic safety switches on all doors. Back up sensor on conveyor for bowl control. Discharge height: 32 ± 2 in.